In this episode, Breja and Jen talk about Blizzcon, review what they’ve been up to in Season Six, mention a bunch of Diablo related news, and as point out awesome fan created stuff. There’s a whole lot packed into this episode! * We read and responded to tweets from: @jnole1973, @The_Breja, @Slugnutty, @queenofhaiku, @TheWMWorkshop, @Cybrwolf0, @Walkman8, @CruentusRelic, @josukeshair, @Vespertilio1189, @thealenationer, @enceladusxp, @eG_acefisher1, @Dredscythe, and @Hasteur. * We got email (with audio) from @Ceraphus – who is a host of The Sundering Podcast. Those of you who are going to be at Blizzcon this year should definitely check out Con Before the Storm. 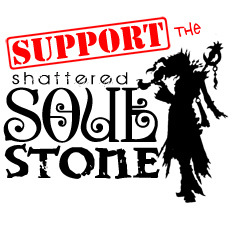 The hosts of Shattered Soulstone have attended the party in the past and highly recommend it. Please check out the Con Before the Storm Kickstarter for more information (and to help the event grow). * We also got email (including some audio) from Algaron and from Ambience. Send your comments, questions, and Diablo related stories to show@ShatteredSoulstone.com and we will share it on the next show. * Community Manager Nevalisits posted “First Look – Season 6 Journey” on battle.net. It has good information about what to expect from Season 6. * Forum Post on battle.net: “What’s Your Favorite D2 and D3 Boss Fight?” is where players (and Community Manager Nevalistis) are sharing their favorite boss fights from each game. * Forum Post on battle.net: “Gem Upgrades on PTR Reverted to Snail’s Pace” is about, as you may have guessed from the title, the slowness of gem upgrades. Community Manager Kauza responds and clarifies things. * Community Manager Nevalistis posted “First Look – Season 6 Rewards” on battle.net. It includes information about new cosmetic rewards, Season Journey rewards, information about how to unlock Haedrig’s Gift, and details about each of the sets that are being offered this season. * Check out the photos of the Legendary Swag Blizzard employees get for 5 years of service – the 5 Year Sword! (You might also find a transog for it in-game). * Tatasinke featured Shattered Soulstone episode 117 in his New Tristram News. * Reddit Diablo has a very helpful Season 6 Megathread for people seeking advice about Season 6. * Reddit Diablo has a Season 6 Looking For Group Megathread for those who want to find a group to play with during Season 6. * Jen has started putting together Book of Jen, a Diablo focused website. It is currently a work in progress as she moves her existing Diablo blogs over there from her personal website. So it’s “not ready for prime time”, but it exists.